ENCINERATE was designed to help increase your body’s ability to burn fat through metabolic stimulation! No jitters, no shakes. Just smooth clean energy with enhanced fat encinerating effects! Vitamin B12 with our time released blend of Caffeine Anhydrous and DiCaffeine Malate (Infinergy™) you get sustained energy and focus for a longer duration. 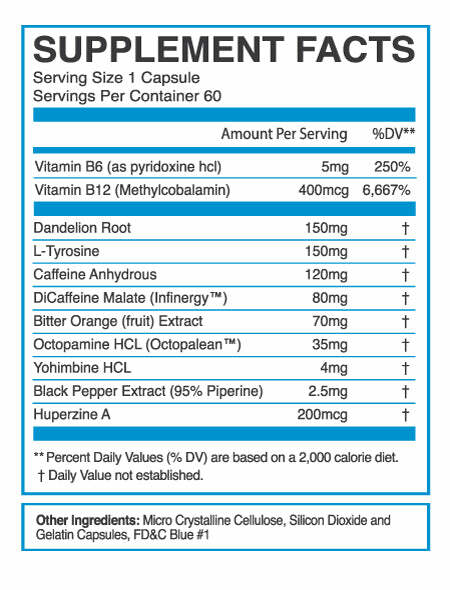 Combined with other powerful stimulants and metabolic enhancers such as Bitter Orange Fruit Extract, the highest quality of Octopamine HCL (known as Octopalean™), and the highly effective Yohimbine HCL. We also included the cognitive enhancer, Hupenzine A for improved focus & mood. Along with the addition of the natural diuretic; Dandelion Root to help rid the body of holding excess water. Get all around optimized fat burning and leaning effects! I had to stop taking this product. It putting me into a state of jittery, feeling out of control. It is very powerful. Hi Julie, ENCINERATE is a powerful stimulant based fat burner. If you have a low tolerance to stimulants (like caffeine) it may take a week or so for your tolerance to adjust. We recommend starting with only 1 Capsule (180mg Caffeine) and taking with food. If you're looking for a stimulant free fat burner we recommend our ELIXIR PM! I love this stuff!! Finally a fat burner that works but doesn’t make me jittery or sick feeling! This fat burner tops the competitors. I’ve used to take Oxy Elite Pro and nothing compares to it and was always trying searching for the right fat burner to keep my cortisol levels at bay. When I was introduced to this I got hooked and it works great! Finally something worth calling a fat burner! Helps with energy and waking up at 3am to go sprint in a RV factory all day. My work out is Work most days. Go all out for about 5-7 hrs a day. I’m also a sour gummies junky (which is horrible for me I know haha)So these products have helped me and Iv introduced it to many others at work that have started using them.